Shu?ng ? , or frost, is my Mandarin word for the day. It rhymes with “wrong”. 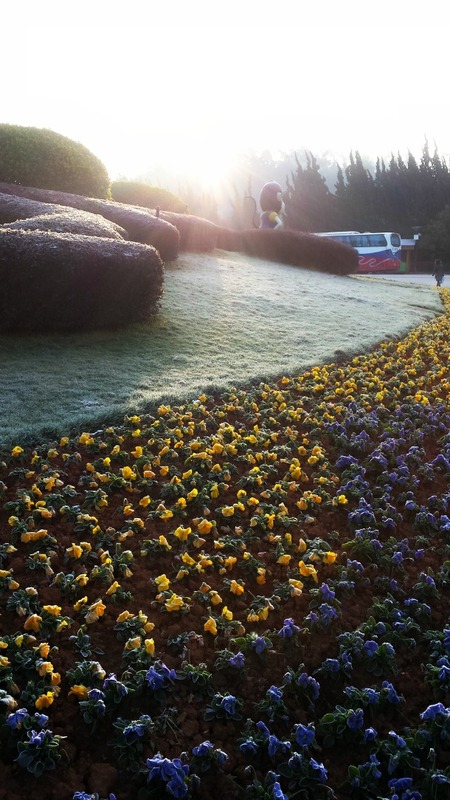 And that’s exactly how it looked covering all the flowers on my walk through the Kunming Horticultural Expo this morning on my way to school. Coming up with goofy sentences is my approach to learning new vocab. And that giant monkey you see near the sun rays is not one of my students. It’s the Expo’s mascot. I can also say squirrel, s?ng?sh? which sounds like song-shoe, and pine tree, s?ng?shù, which is also song-shoe, but with a different inflection. Saying squirrel, pine tree and frost to a cab driver really doesn’t much when what I really want to do is get to Walmart.